DAP German Accreditation System for Testing Ltd., Germany. FRAUNHOFER Institute for Non-Destructive Testing, Germany. the modification, further development and new development of test methods within the scope of accreditation without having the necessity to give notice about it to the accreditation body in advance. The flexible scope of accreditation makes it possible to react faster with modified and specific customer desires. Especially in case of research and development laboratories, the flexible scope of accreditation is particularly significant, if there's no chance to have resort to known test methods. The new ISO/IEC 17025 "General requirements for the competence of testing and calibration laboratories" was published in February 2000 replacing the EN 45001, as well as the ISO/IEC Guide 25. The scope of the new Standard includes the flexible accreditation. Although special requirements have not been specified in this connection - they nevertheless are the consequence of the conditions there mentioned. If the desires of the customers cannot be fulfilled with a standardised test method as a result of an examination of the contract, an agreement has to be stipulated with the customer on the use of modified or new developed test methods. The validation of a test method also includes the contemplation of the influence of the applied software on the computer technique of the sample and test head manipulation, as well as the software of the test including the evaluation of its results. Also the calibrations for the handling of the tests, e.g. the handling of test or calibration pieces with known characteristics, have to be integrated in the validation - as it has been common practice for a long time e.g. in the area of non-destructive testing. The new ISO/IEC 17025 in addition requires the estimation of uncertainty of measurement. Considering the area of non-destructive testing, this requirement though has to be seen differently because, as a rule, there are no measurements but tests to be performed. An accredited testing laboratory should indicate however the application limits, the limits of detection and the reproducibility for the test to be carried out. The new Standard, in comparison with the EN 45001, expressly allows the communication of opinions and interpretations, too. Although not object of the accreditation, especially in case of the flexible scope of accreditation, they allow the accredited NDT laboratory to have a wider area of activities. There's an essential enlargement in the new Standard concerning the direct association with requirements of the ISO 9001/9002. As a result, the laboratory accredited against ISO/IEC 17025 doesn't need a separate certification of its quality system any more. The two following examples of the Application Laboratory of the FRAUNHOFER Institute for Non-Destructive Testing (IZfP) in Saarbrücken demonstrate how a R & D laboratory for NDT profits by flexible accreditation in order to respond quickly to customer's needs, especially if the testing problems of the clients cannot be solved by normalized methods. For the evaluation of stability and remaining life time of a lamp post it is important to have knowledge of wall thickness of the area of support and of the degree and depth of corrosive wall erosion. In order to determine the state of corrosion, the superficial content of the in- and outside surface of the lamp post has to be controlled 200 mm up- and downward from the point of ground entering. Until now this could only be achieved by laying open the lamp post. This is very expensive and time consuming for lamp posts in concrete or pavement surfaces. For quick execution of this test without the need for excavation work, a new testing technique had to be developed. The requirements of the testing problem can only be solved by the use of electromagnetic ultrasonic waves. This ultrasonic wave is not excited within the probe but within the test object itself, which eliminates the need for a couplant. The wave also spreads several 100 mm inside the material of the tested pipe without being influenced by the surrounding medium. The principal solution is illustrated in picture 1. An ultrasonic probe is attached to the lamp post with a manipulator 300 mm above ground and moved around the post by remote control. The ultrasonic probe electromagnetically stimulates an ultrasonic wave inside the pipe material which spreads towards the ground. If there is corrosive wall erosion on the inside or outside of the part of the pipe that is covered by the wave, the ultrasonic energy is partly reflected and will be registered as an echo signal. The probe covers a distance of approximately 500 mm. The testing is done drily, there is no need for a coupling fluid or any special surface preparation on the post. The principal of testing is illustrated in picture 2. The testing is done automatically. While the probe rotates around the post a computer records the echo signals together with the position of the probe every 2 mm and after one complete rotation of the probe it displays a so called ultrasonic-B-picture on the computer monitor. A few minutes after the start of the test the tester already has a first overview of possible corrosion on the pipe's wall. picture 3 shows an example of a result display. The principal of the applied electromagnetical stimulation of ultrasonic waves has been developed during several research projects. Many papers and scientific publications illustrate its function mode, fields and limits of application . 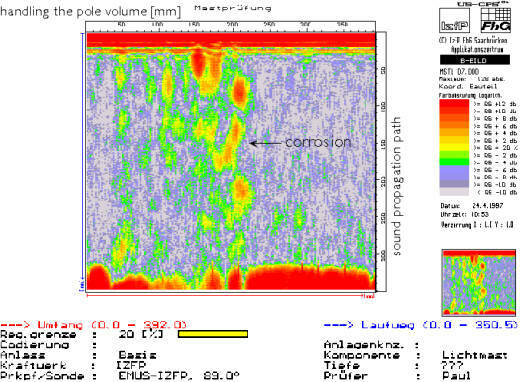 The use of guided ultrasonic waves for the determination of corrosion is the novelty for the described application. For this, the development of an appropriate probe, manipulator and of a specific software for data recording, evaluation and visualization was necessary. Validation of this testing method was an important step, realized on the basis of "Recommandation for validation and characterization of testing methods"( Empfehlung zur Validierung und Charakterisierung von Prüfverfahren ) from the German Council of Accreditation (Deutscher Akkreditierungsrat (DAR)) . characterization of the testing method by determination of the needed method parameters and, by that means, the capability determination of the applied method for its field of application. In the present example, the capability of the described testing method has already been showed in lots of research reports. For the specific use, only a description of the proceeding was necessary. Furthermore, an analysis of the parameters with influence on the testing results, such as wall thickness, geometry, or material of the tube, had to be realized. For the evaluation of the procedure capability being sufficient, the testing problem had to be analyzed, too. Requirements with regard to the type, location, dimension of the flaws to be detected, time base range and velocity had to be specified. For this, representative reference blocks with artificial and natural corrosion were fabricated and tested. Finally, the test results were examined. picture 3 shows the measurement results of a reference block with natural corrosion. After the succesful proof that the problem can be solved by the applied technique, the approval of the testing method follows. personnel training for the newly developed technique . The validated test method can now be applied as accreditated one without being demonstrated at the accreditation body, the great advantage of the flexible accreditation. It can also be given to testing companies who demonstrate it to their accreditor as a survey-audit in order to be used in the accredited testing laboratory later on. There has been a death after an accident when the boiler tubes had exploded . After that incident all boiler tubes of that kind being older than 30 years had to be tested. Those were tubes of St 35.8 and 15 Mo 3 with an outer diameter of 70 mm and a wall thickness of 4 mm with stress induced corrosion. All cracks with more than 1 mm had to be detected. The usual testing methods of radiographic-/ ultrasonic-testing and visual inspection were on the one hand only to be done under hard conditions because wall material had to be removed. On the other hand the detection on the needed scale was not possible under the given circumstances. The expert witness wanted a visual inspection of the inside of the tube with the help of an endoscope. Analysing the testing problem showed that the needed inspectio resolution could be achieved by eddy current testing from the inside of the tube. The intended testing method -the multi-frequency eddy current technique- was (like the method given in the first example) well known and described . Concerning the present testing problem a feasibility study had to be done to get some information about testability of the tubes by the help of eddy current. That was done with tubes which had artificial defects. 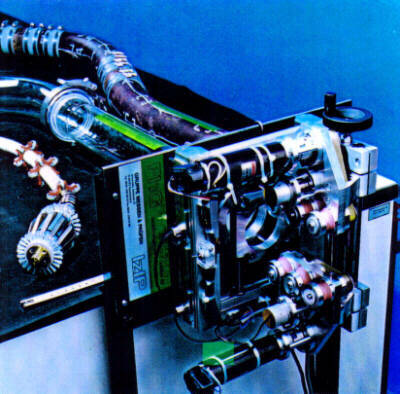 For the automatic testing a testing pig was developed having a CCD-colour-camera as well as a probe-array with eddy current probes of a widness of 16 mm. By the help of those the complete volume of the tubes could be tested without rotation of the probes themselves. For the validation of the pig all parameters having any influence on the tubes were imitated and tested. Glass tubes were built with all geometrical particuliarities namely in radius, ovalization up to 6 mm, irreguliarities of the weld and root slack up to 7 mm was rebuilt (see figure 4). 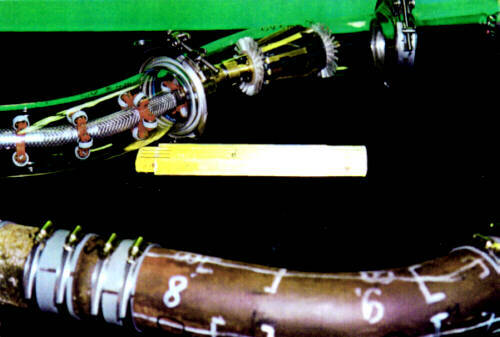 The testing pig is being pushed 6 m into the tubes by a drive unit (see figure 5). The validation of the multi-frequence eddy current technique was done with the original tubes having artificial and real defects and with the surface state present in reality. As problematic appeared to be the protection of the probes against abrasion due to the rough surface and the root slack. Another main part was the egalization of the testing sensibility of the 16 probes. In the production of the eddy current probes there had to be used new ways . The probes were produced from areburn corrosive flat bobbin. There had to be set up special testing parameters and coefficients for every material type and structure state. Suitable calibration blocs had to be got, too. To get there the different states had to be classified. The suitability of the blocs for calibration had been demonstrated during the process of validation. The calibration of the testing system was done in the testing lab with different calibration specimen which were each representative for special tube types and had simple artificial defects such as 1 and 2 mm deep and 40 mm long cracks. The representativity of the calibration was tested at the test objects themselves. Before the use as an accreditated testing technique a description of function and an inspection instruction as we have seen in the first example was made and the personnal was trained according to the new techniques. Due to the high requirements concerning the reliability of the testing system an additional certification carried out by an expert organization was run through in our own testing labs . The results found by the help of this testing method were checked by radiographic testing in the built-in state. In both examples mentioned the testing problem could not be solved directly be the use of a given or even standardized method. Redesign or modifications were necessary leading to completely new testing techniques. By using the procedures of flexible accreditation the methods could be used in a state of the art way. Furthermore, the required qualifications for the personnel due to DIN EN 473 could be met by additional training on the new methods. Deutscher Akkreditierungsrat: "Validierung im Prüfwesen Empfehlung für Prüflaboratorien und Begutachter"
TÜV-Bayern: "Prüfung an Dampfkesselanlagen anlässlich des Dampfkesselknalls am 19.10.1994 in Bonn"
R. Becker, M. Disqué: "Beitrag der Mehrfrequenz-Wirbelstromprüfung zum Nachweis der Integrität der austenitischen Druckbehälterplattierung von Kernkraftwerken"
dem Manipulationssystem WS-SCAN 1 und dem computergestützten Prüf- und Datenaufnahmesystem CPS für die Prüfung von Kesselrohren"